After last week’s onslaught of post-season League 1 graphics I realised there were still a lot of useful – but less obviously visual – stats that I hadn’t managed to work into anything I’d produced. I’m working on a couple of template designs to house some of the simpler stats next season so I thought I’d road-test one of them here by pulling together some club rankings covering a range of measures that might make for some interesting comparisons. I’m always happy to field requests for anything people would like to see, and may well ask a few questions ahead of next season about what sort of thing I should be focusing on. The source of Gillingham’s struggles isn’t difficult to spot: only three clean sheets all season! The next worst-performing defence kept three times as many. With three of the top four teams in this table also occupying top four spots in the actual league table, it just goes to show how important a good defence is. The odd club out is Oldham, who we’ll revisit a bit further down. We can’t not mention that hugely impressive sequence put together by Millwall, which lasted from mid-January until early March. The Gills are bottom of this table too: the longest they went without conceding a league goal was just over two matches. Again we have three of the actual top four at the summit, which isn’t a huge surprise. Oldham staying up despite failing to score in over half of their matches is as surprising as it is impressive, although it probably wasn’t all that fun to watch. It just goes to show how hard their defence – which as we saw above kept the joint-2nd most clean sheets – must have been working. Impressively Southend – who narrowly missed out on a play-off spot – never two whole matches without finding the net. Wimbledon broke the record for the longest barren run of the season by a single minute right at the end of their campaign. After an impressive showing they didn’t score at all in their six April matches and sunk into the lower half of the league table. Millwall lead the way here, with just over a quarter of their goalscoring attempts coming from the air. Walsall meanwhile are a side who like to keep it on the deck, with fewer than one in ten of their shots being headed goalwards. Wimbledon aside, the teams at the top end all finished near the top of the table. The exception is Scunthorpe, who were happy to shoot from range this season and certainly didn’t suffer for it, although I’m not sure that it’s a sustainable strategy. At the bottom of the chart we see a potential explanation for Oldham’s poor goalscoring record, with the Latics one of three teams who took more than half of their shots from outside the box. My E Ratings model really likes Oxford and I suspect it’ll be tipping them to go one better and finish in the play-offs next season. Along with champions Sheffield United they out-shot over three quarters of their opponents this season, which is pretty impressive. Port Vale were a team that the model was worried about from the start due to the small number of chances they were creating and that’s apparent here. Both they and Oldham outshot fewer than a quarter of their league opponents this season. Once the Blades got in front, they tended to stay in front, taking over 90% of possible points in games where they led. Interestingly some teams that didn’t fare so well – such as Peterborough, MK Dons and Shrewsbury – also defended leads well, so if they can get their noses in front more often next term then they should be able to secure higher finishes. At the bottom we find Gillingham again – another effect of their aforementioned defensive issues – along with three of the four relegated sides. The Gills dropped an eye-watering 36 points from winning positions which, if all added to their final haul, would have put them level with Bolton on 86! Four of the top five clubs are at the summit of this table, with title-winners Sheffield United having recovered almost half of the points in games where they were trailing (28 from a possible 60). Coventry’s problems are plain to see: they recovered just two points – both home draws – from the 27 matches in which they found themselves behind, losing the other 25. 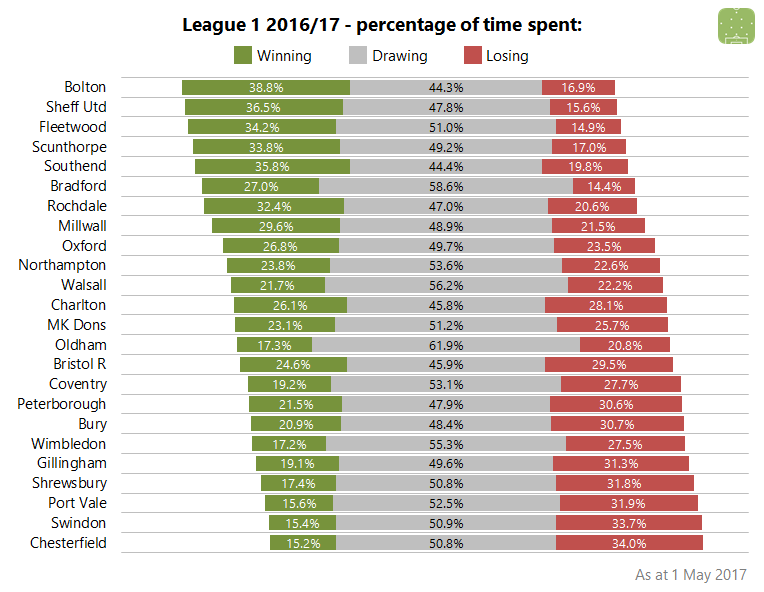 Before I looked at this data I thought most of the top-performing sides would be relatively clean, but Sheffield United scrapped their way to the title. The Blades committed more fouls than their opponents in almost two third of their matches this season, unlike erstwhile promotion rivals Bradford who only did so in around one game in five. So Chesterfield winger – and former Chelsea youth prospect – Reece Mitchell was fouled most often this season. Along with Anthony Grant he was one of only two players who suffered more than three fouls per 90 minutes. The most aggressive player by far was James Hanson, who interestingly left the team that out-fouled their opponents the least and joined one of the clubs who did so the most. The big striker committed around two and half fouls per game on average this season – far more frequently than anyone else who kept referees busy. Edit: I realised I forgot one chart, which is how long each club spent winning, drawing and losing. This has been sorted by the difference between percentage of time spent winning and losing. The top of this chart bears a close resemblance to the actual table, with the order slightly reshuffled. Bradford would probably have preferred to spend less time drawing. The only side to have spent longer in stalemates is Oldham, which tallies with their overall “poor attack, good defence” vibe. Three of the four relegated teams are at the bottom, which isn’t a surprise, but it’s strange to see Wimbledon down there. That awful run-in no doubt sank them a few places.